Interview with Rob Boffard, author of Tracer. Jay O’Connell is a writer, artist, activist, human living in Cambridge MA with his wife, two kids, two cats, and eight zillion books. 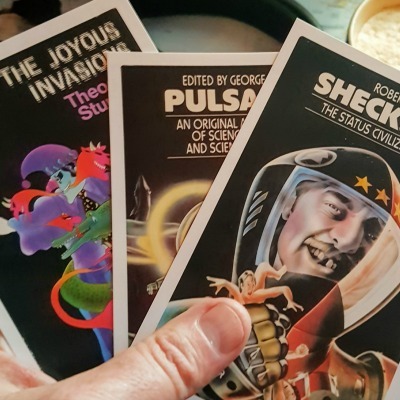 A graduate of Clarion West in the nineties, Jay quit writing for no earthly reason for over a decade but returned in 2012 with a bunch of shorts and novellas in Asimov’s, F&SF, Interzone and Analog, fulfilling a life long dream. He blogs about his social media addiction and writing at www.jayoconnell.com, dreaming his life away, awaiting the singularity—or something equally entertaining. He thanks, profusely, his family and writing workshop, Griffins, for all their support. He spent his early childhood much like the main character of this story spends his days, watching reruns of old TV shows like Hogan’s Heroes. He even met a member of the cast, Howard Caine, and sang folk songs with him at a Hootenanny in Santa Monica, California. and moved into an owl preserve in Southern California. Thanks for the great work on my story! You guys are wonderful! Everyone loves the narration!